I call it the Closet Principle: What you do in secret is what moves you in public. The Baltimore Ravens terminated the contract of running back Ray Rice after TMZ released a hotel elevator surveillance video showing the horrific knockout punch that he used against his fiancé, Janay Palmer. Although she went on to marry Ray, the incident is without excuse. The NFL has now indefinitely suspended him – stripping him of his ability to play and to receive his enormous salary. Some men will argue that she had it coming to her – that she showed aggression first – yet, there are alternatives to striking a woman. Ray simply could have dismissed her and severed the relationship without physical violence. That would have been the honorable thing to do. Men will pay for the evil which they do against women. According to Safehorizon, a domestic violence assistance organization, one in four women will experience domestic violence during her lifetime. It is an epidemic to say the least. There are 4 million physical assaults and rapes by their partners. If a man raises his hand against a woman, he forfeits authentic manhood, and has proven himself a coward and weak man. He deserves the shame of his stupidity. A FivestarMan has the deep purpose to be gallant in relationships. His hand is designed to bless, not beat – to protect, not punish – to caress, not curse. Understand and embrace the differences of a woman. The male and female have perfectly complementary designs. When God created man He created him male and female in one body. Then God saw that it was not good for a man to be alone, so He extracted the feminine side of Man out and made woman. In this manner, the only feminine side of the male should be his wife. She is a complement to him. If a man doesn’t understand and embrace the differences of a woman, they will have unresolvable conflict and strife. If he embraces her and her differences, he will experience greater joy and fulfillment in life. Use your hand to cultivate your wife. The art of husbandry is in the very nature of man. He has the ability to draw out the great potential of his wife; therefore, his hand should never strike against her flesh but should serve to care and cultivate her. According to one study, there are 64 physiological benefits to the human touch. In other words, when you “lay hands upon” your wife, her body receives a chemical boost from your touch. There is more to the touch than the physical. It can have a spiritual healing effect upon her as well. 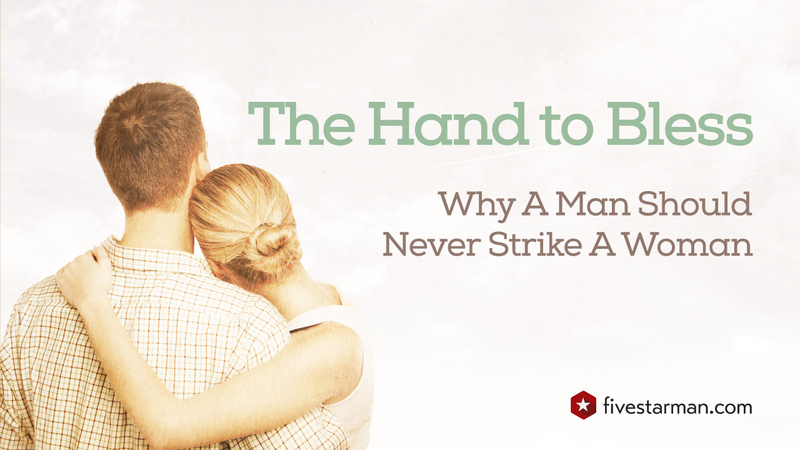 This is why a man should never raise his hand against his wife – he not only robs her of his healing touch but also turns his hand of blessing into a hand that curses. Position yourself as protector of your wife. Be a strong man, a protector of your wife. Never be in the position of an abuser. Our attitude should be that we will lay down our lives for the sake of our wives. An authentic man isn’t misogynistic – he doesn’t have antipathy toward women. We don’t fear empowering women because we’re strong men. Our strength is not displayed in brutality toward women but in the willingness to stand strong and protect women. If you are in a relationship that is filled with strife and conflict – simply remove yourself from it – severe the relationship. Never raise a hand to strike a woman. The way this article is written indicates you are a follower of the belief God is both masculine and feminine rather than a unique, divine being. I won’t try to debate this theologically, because I’m sure it won’t sway you. But I do ask you to consider it logically. IF God is both masculine and feminine and made the man in His image, imparting both femininity and masculinity to man, when God took the feminine out to create woman then the man was no longer in God’s image and the woman was NEVER made in God’s image because she never was masculine. Outside of theology, this teaching doesn’t pass the common sense test. Please renounce this teaching, repent and advise you disciples to do the same. You’re jumping to a lot of conclusions regarding my theology. And frankly, you’re arrogant to call me to repentance regarding it. What should a man do if his wife is beating him with a broken-off table leg, shielding his daughter while she beats the father of her child? A lesser man would have put her in the hospital with one fist. Instead I walked away from it all, and have not seen my daughter in 3 years. No one should hit anyone. A man who hits a woman is indeed a coward, but a woman who hits a man has to be one of the most naive creatures ever born. She is risking her life. Jake, this happens more than it is known. I realize how difficult it must be. Here’s what I would say on this matter. You may have an ex-wife, but you do not have an ex-daughter. I would use whatever legal process that I could to ensure her safety and upbringing. I would also make sure that my life is reflecting authenticity and walk in faith to be the man and the father that I should be. I am praying for you. Thank you for your comments. I am so thankful that you both received encouragement in your marriage from this article.